Another manufactured covfefe is brewing in Portland (of course), where Portland Police Lieutenant Jeff Niiya is accused of playing too nice with pro-Trump organizer Joey Gibson, who has staged many rallies and protests in and around Portland under his organization Patriot Prayer. Surely you’ve seen the videos and pictures here on The Gateway Pundit of the brawls and chaos from these events as antifa agitators usually show up to start fights. Niiya is part of the central precinct command and the commander of the bureau’s Rapid Response Team, aka Riot Squad. He has been assigned to command roles during nearly every protest over the past several years. 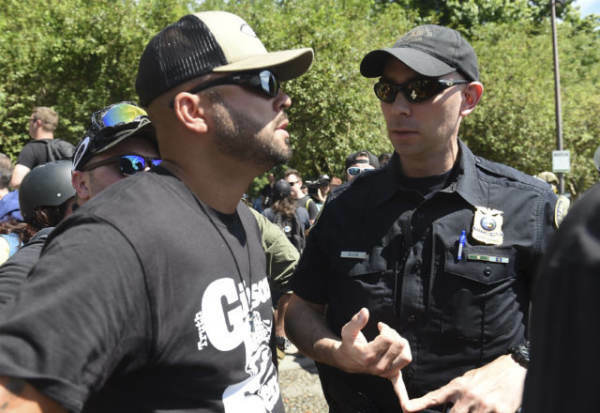 A string of text messages between Niiya and Gibson were found in a public records request by one of Portland’s pro antifa rags, Willamette Week. The document dump shows hundreds of text messages that were sent back and forth between Gibson and Niiya, with Niiya passing on some of the information to other officers. Portlanders are flipping out over this, claiming that Niiya is favoring the pro Trump side of the protests. In addition to the media and activists, pro antifa vichy “mayor” ted wheeler (intentional lower case) has condemned the practice and is launching a full investigation into the matter. It turns out this is just standard protocol. Lt. Niiya was gathering information from Gibson, sharing it with other officers, and they used that information to at least attempt to keep the peace at these dueling protests. Niiya had also reached out to people involved in antifa circles, but they were less receptive. In fact, one far left antifa protester learned the hard way what happens when you talk to the police. An activist who goes by the name “Tan” (and identifies as gender non-binary) had taken part in several anti Trump protests, and also started communicating police. Tan was concerned for the safety of the public and activists, and wanted to open lines of communication with the police. After four months being an inside informant, Tan was outed by one of the other protesters after all of the text messages were discovered on Tan’s phone. Tan was promptly ostracized by her now-former friends, and antifa circles started doxxing Tan, basically making Tan’s life miserable. The officer whom Tan was in correspondence with? The very same Lt. Jeff Niiya. Niiya has now been relieved of his duty as Rapid Response Team commander. Included in the slew of documents discovered are several emails that were passed around between police bureau members. 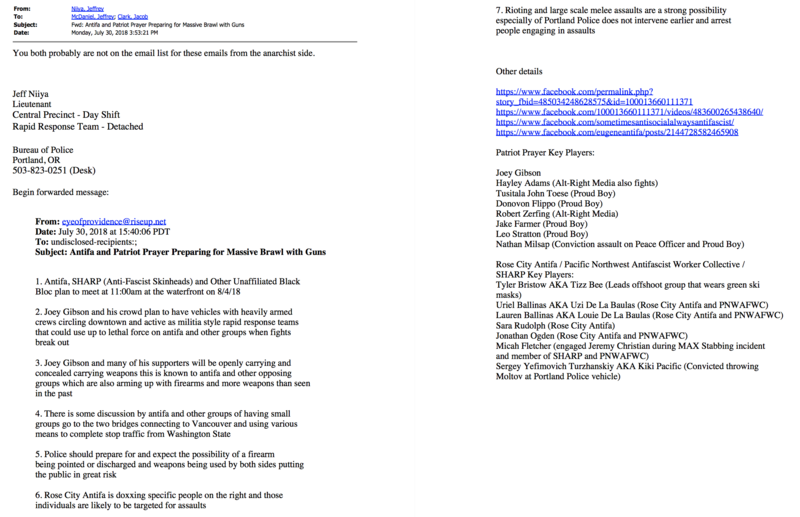 Some of the emails involved the information that Niiya had received from Gibson, some were of general intel gathered from things like facebook event pages, but two specific emails pique one’s attention; One from a city employee named Philip Wolfe, who works in the “office of equity and human rights” as a disability advocate. 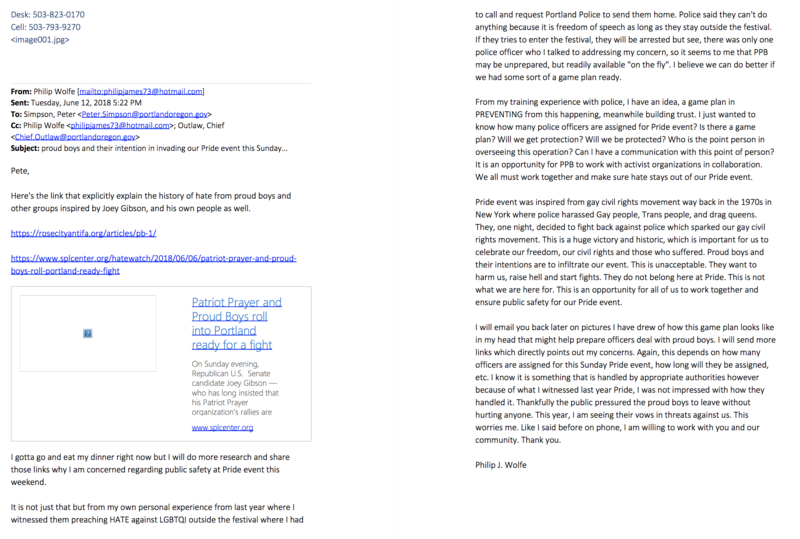 In his email he voices his concerns about Gibson and company crashing the Pride parade, and wanted to know several details regarding the police bureau’s plan for the event and offered up his own ideas for strategy. Wolfe cites SPLC and an antifa website as his sources. Another person tipping off the police uses the email [email protected] . This person seems to have intel on both the Patriot Prayer side and the antifa side, and shares names and other info with the police, including possible tactics by both sides, such as claims that Gibson was going to have heavily armed militia members circling around the area to open fire on antifa. Some of the individuals named by eyeofprovidence in the police documents include members of the media, who are lumped in as part of the Proud Boys. One of those individuals is Nate Millsap, who works as a video stringer and runs his own YouTube channel, Stumptown Matters. 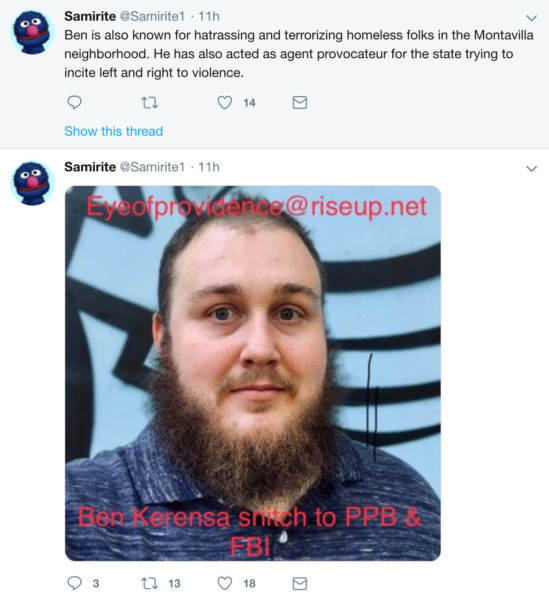 Riseup.net is a far left activist website and email host, which helps users stay anonymous. 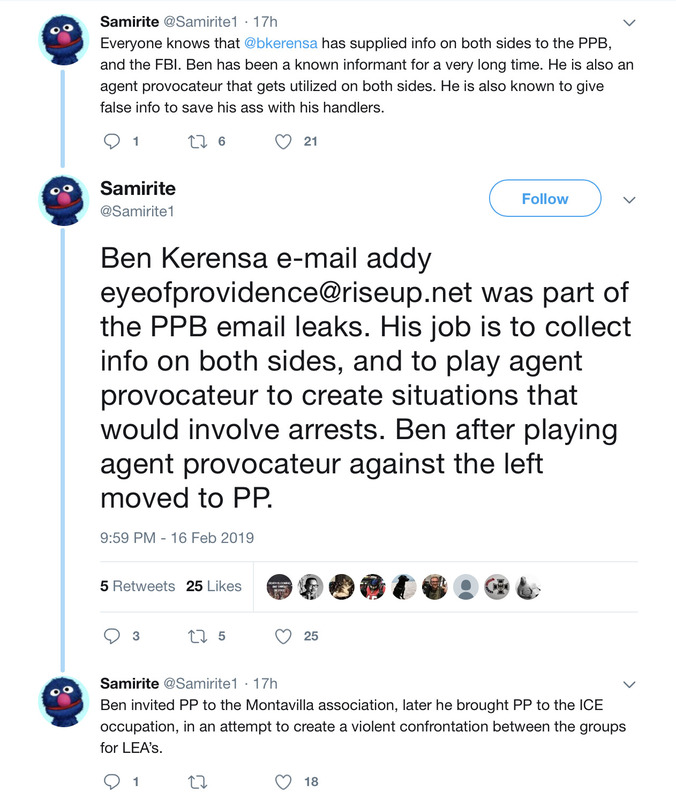 Odd that someone from the antifa circles would be acting as an informant to the police, using that email to communicate with police. This has not gone unnoticed by the antifa and anarchist circles. 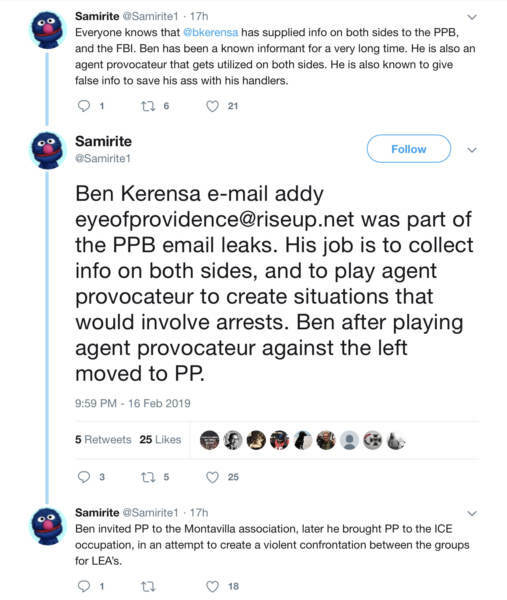 One user on twitter alleges that [email protected] is an email account belonging to one Benjamin Kerensa, who used to take part in protests. Kerensa has been known to attack journalists and other activists (here, here, and here), and has long been accused of being an informant, as he always seems to avoid arrest when things get out of hand at protests. He also has a lengthy criminal record, which has resulted in three trips to federal prison. The Eye Of Providence is the pyramid with the eye in the middle that is often associated with the Free Masons and Illuminati. Pretend mayor ted wheeler is also calling for “training for the Portland Police Bureau on identifying white supremacy” while saying nothing of identifying violent leftists who regularly riot and terrorize the city, or the blatant black supremacists involved in groups such as the Black Riders Liberation Party, or the MS-13 gang members.